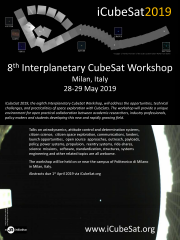 Introduction: CubeSats have demonstrated their utility as a standardised low-cost, low mass-volume platform, with the current largest format (12U) not exceeding 22x22x34cm3 and 20 kg. In line with the increasing interest in the human colonisation of the Moon or Mars, CubeSats find themselves on the verge of being deployed for scientific purposes outside their traditional terrestrial orbit. With increasing mission complexity, inter alia, requirements for both the pointing accuracy of the antenna (X-band) and the electrical power budget (electric propulsion) aboard the satellite increase. To address these challenges, the design of a panel array drive assembly (PADA) for CubeSats is presented in this paper, that enables precise antenna and solar array orientation to optimise link and power budgets. Motivation: Development of the PADA is being conducted within the lunar SIRONA mission, which is a 12U CubeSat lead by the Space Center (CS^3) of CentraleSupélec, France. Autonomous travel to lunar orbit or beyond requires some form of propulsion. Large-scale satellites conventionally rely on a chemical propulsion; however, with the more stringent mass-volume constraints of a nanosatellite, electrical propulsion emerges as the primary choice for long-range missions with moderate payload (The SIRONA mission will use electrical propulsion to reach the lunar orbit). Nevertheless, electric propulsion accounts for the clear majority of power consumption on-board. System design: For the PADA, the same low mass-volume constraints apply as for the whole CubeSat. As a system to be tested on the SIRONA mission, the PADA is tailored to the current ISIS 12U specifications. This distinguishes it from previous PADA-equivalent concepts on 3U CubeSats. The primary design objective is to utilise unused space to package the PADA. Considering the 12U format, the greatest unused volume is a prism, 3U tall with a ‘+’ shaped cross-section. The volume available for PADA within the prism is 220x20x40 mm3. The PADA accounts for rotation in a horizontal axis. The reaction wheel on the vertical axis of the ADCS will complement the system and allow array orientation anywhere in space. Conclusion: The PADA addresses the increasingly complex requirements of CubeSats missions; the implementation of more powerful payloads, propulsion systems and higher gain antennas are essential to the success of deep space missions.